This article discusses optimal methods for assisting patients with sit-stand transfers where moving-and-handling equipment is not required. The article explains the importance of effective mobility care in optimising patients' rehabilitation and enhancing their independence. 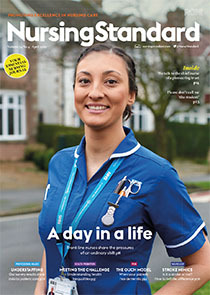 The term ‘assistance’ is used in this article to refer to the support nurses can provide to patients during sit-stand transfers, but excludes manual assistance. Nurses should attempt various ‘hands-off’ mobility-enhancing strategies to assist the patient, such as the use of verbal, visual or light manual cues. There are three main considerations when assisting patients with sit-stand transfers: maintaining the safety of the patient and healthcare staff; optimising the patient's mobility; and the use of a person-centred approach to care. It is important to ensure the correct biomechanics of sit-stand transfers are followed during these procedures. How you think this article will change your practice when assisting patients with sit-stand transfers. How you could use this resource to educate your colleagues about sit-stand transfers.